It's the story of so many hand-painted yarns: I fell in love with the colors, but they refused to cooperate on the needles. One day, I'll write a country-style ballad about the problem. In the meantime, Mary Thomas's Book of Knitting Patterns presented a coping strategy, in the form of the Sugar Stick Rib pattern. 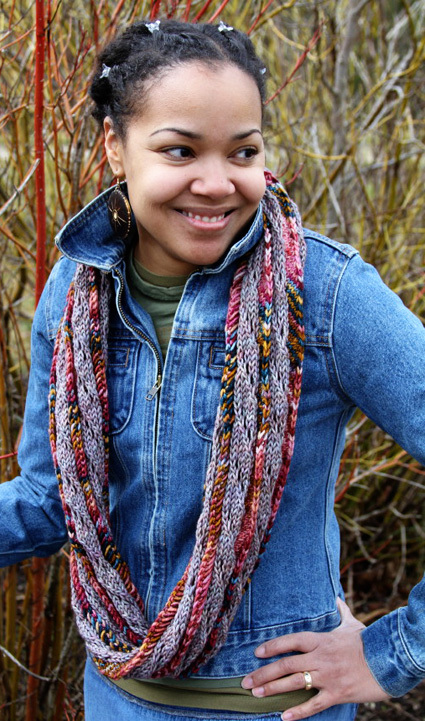 I modified the pattern to give the wild hand-painted colors a chance to peep through the yarn-overs in the semi-solid yarn, in addition to the dazzle they provide in the colored band. The result allows the hand-painted yarn to provide a sweet twist of color. 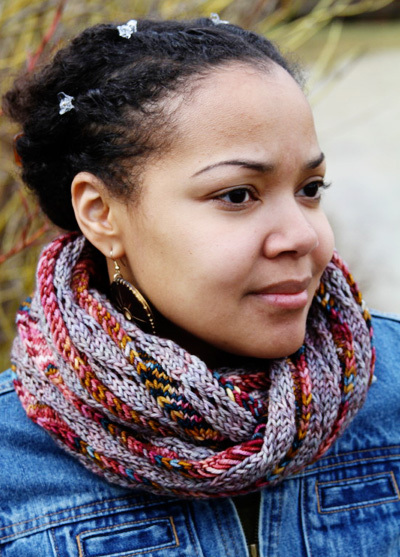 The pattern is easy to memorize and is a great project for mastering two-stranded knitting. Although the hand-painted band looks thinner, both color bands are six stitches wide. The optical illusion is created by the yarn-overs in the semi-solid band, which allow those panels to spread out a little wider after blocking, while the decreases at the edge of the hand-painted panels pull them in slightly. When selecting yarns for the project, both should be similar in weight. To achieve the effect shown in the photos, choose a semi-solid yarn (MC) that matches at least one of the colors in the hand-painted yarn (CC). 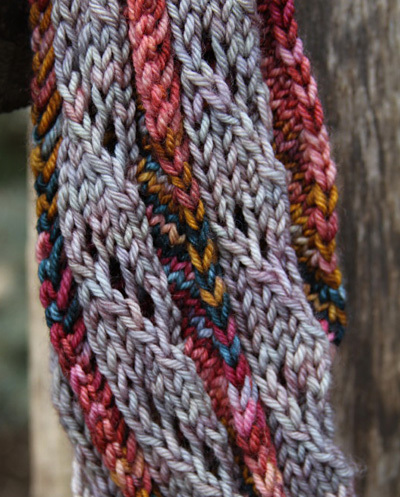 A mostly neutral semi-solid yarn will ground wild colors and show them off to best advantage. Round 1: [CC: ssk, k4; kf(CC)b(MC); MC: yo, ssk, k3] around. Round 2 and all even rows: [CC: ssk, k4; kf(CC)b(MC); MC: k5] around. Round 3: [CC: ssk, k4; kf(CC)b(MC); MC: k1, yo, ssk, k2] around. Round 5: [CC: ssk, k4; kf(CC)b(MC); MC: k2, yo, ssk, k1] around. Round 7: [CC: ssk, k4; kf(CC)b(MC); MC: k3, yo, ssk] around. Round 8: [CC: ssk, k4; kf(CC)b(MC); MC: k5] around. Kf(CC)b(MC): Knit into the front of the first MC stitch with the CC yarn, and into the back of the same stitch with the MC yarn. 2 sts made from 1. Make sure to keep your floats loose! You're working a small-ish round on the circular needle, so this will help stretch out the floats as you work, but do keep an eye on the back of your work to make sure you are not pulling the thread too tightly, especially on the starting ssk stitch. 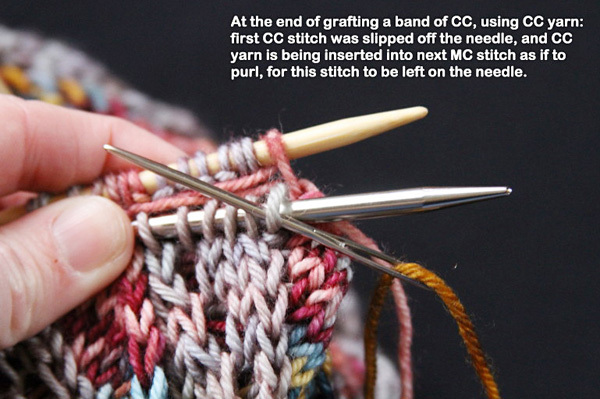 Directions and tips for colorwork can be found here. 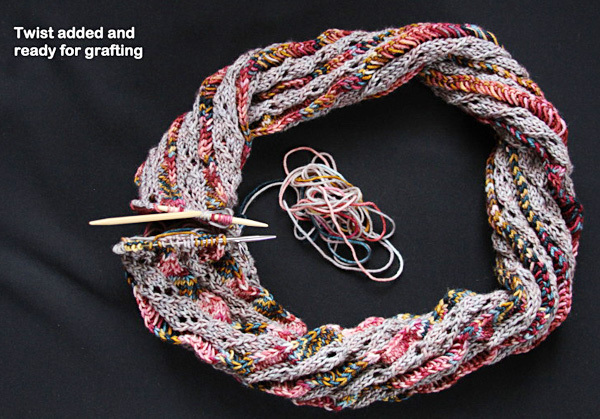 The trickiest part of the pattern is grafting the two ends together using alternating yarns. Some experience with grafting is recommended. Instructions for one color grafting can be found here. Using a provisional cast-on, cast on 60 stitches using waste yarn. Join both MC and CC. Set-up Row: [K6 CC, K6 MC] to end. Place marker and join to knit in the round, being careful not to twist. Work the 8-row pattern 26 times, working from Chart or written instructions as you prefer. The piece should measure approximately 48 inches in length, ending with Round 8 of the pattern. Cut yarn, leaving two tails (one in each color) approximately 20 inches long for grafting. Block the cowl before grafting. When it is dry, put your hands inside the tube and spread the stitches horizontally to even out the floats and stitches before closing the cowl. Undo provisional cast on and return sts to needle. Before grafting the two ends together, add three to four full twists to the tube in the direction of the twist suggested by the stitch pattern. Graft the two ends together, alternating yarn so that you use CC yarn to graft CC bands together, and MC yarn to graft MC bands together. When transitioning from one color to the other, finish the band and do the set-up stitches (the ones left on the needle) in the color of the band you are finishing, before switching to the second color. Make sure to carry the unused thread on the inside of the tube. To make it easier to switch between yarns, use two tapestry needles, one for each yarn. Kris lives on a small farm in central N.J., with her husband, three sons and a flock of Coopworth sheep. 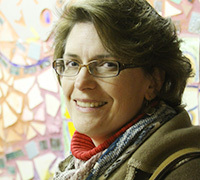 She collects vintage knitting patterns and books that often provide inspiration for her designs. She blogs about sheep, knitting and other facts of life here and can also be found on Ravelry.